If the symbol shown here is shown on any of your goods, it means that the product is classed as Electrical or Electronic Equipment and disposal of it is covered by the Waste Electrical and Electronic Equipment Regulations, 2006. The Waste Electrical and Electronic Equipment Regulations, 2006 (WEEE) are legal obligations to ensure that products are recycled using best available treatment, recovery and recycling techniques to ensure human health and high environmental protection. WEEE must be recycled in accordance with the regulations. It should not put in the bin, but be disposed of separately by taking it to your local Designated Collection Facility (DCF). This will normally be your local civic amenity site (recycling centre). To find your local site, contact your local authority or go to http://www.recycle-more.co.uk/la/la_detailsla.aspx. You may also see the list of approved sites arranged by county at http://www.valpak.co.uk/dts/page1734.aspx. It is likely that approximately 1000 civic amenity (CA) sites will be upgraded to Designated Collection Facilities where WEEE from private households may be deposited. EuroCave Importers Ltd has joined the Government’s Distributor Take Back Scheme (DTS). Membership of the DTS satisfies the WEEE obligations of distributors instead of them having to provide free in-store take-back. We make a financial contribution to the DTS, which is used in the development of waste electrical and electronic equipment collection facilities throughout the UK. 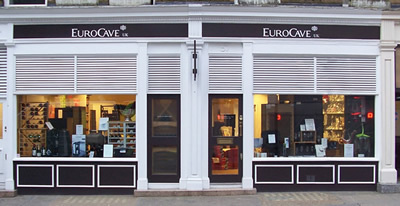 EuroCave Importers Ltd is not required to offer any form of free take back of WEEE until at least 2010. However, from 1st July 2007 if you buy a wine storage cabinet or a cellar conditioner from us you may ask us to dispose of your unwanted similar item. When you ask for this service your old product will be taken back by our Home Delivery team at the time of delivery of your new product. We will recycle the old one for you. Please note your old product should be disconnected, empty (including of shelves) and dry. This service is provided on a like for like basis, for a fee of £75 plus VAT. If you would like to use this service, please ring us on 020 7935 4679 and we will make the arrangements. The service is available is available whether you buy on line, over the phone or in the store. If you change your mind and want to arrange a collection after you have ordered, please ring us on 020 7935 4679 before your delivery date to arrange a collection. Even if you decide not to buy from us we can provide a collection only service to take back an old EuroCave wine storage cabinet or EuroCave Cellar conditioner for a fee of £150 inc VAT. Please ring us on 020 7935 4679 and we will arrange. We regret that we cannot offer the scrap product collection service on non-EuroCave products unless it is in conjunction with the delivery of a EuroCave item. We also are unable to provide this facility in store. Our Terms of Business pass on the legal responsibility for disposal and treatment of redundant product lines to the then owner.